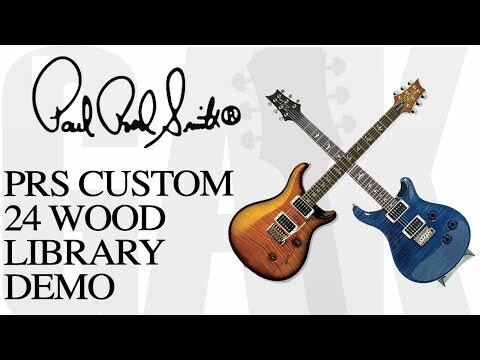 PRS Custom 24 (2013) Experience Model. Owned for close to two years now. Gigged. Hands down, this is my favourite guitar which I'd choose over all others. Ergonomic perfection. The story is that when I turned 30, after 15 years of practising, I thought I had better join a band. First audition (which I passed, yay) was a nightmare though as my Ibanez went microphonic, it was immediately out of tune when I took it out of its case and after that day I said that I deserved something gig-worthy. (A list of previous gear can be read on my webiste). Mahogany body with maple cap. 25" scale length (gauge 10 strings standard which feel great). Flame Orange Fade with book-matched top. 10 top (better figuring - in some cases, it really is breathtaking). 57/08 uncovered pick-ups (classic PAF sounds). Satin flame maple neck (pattern thin - FANTASTIC neck carve). 5-way blade control (no push-pull on tone pot). Phase III (I believe!) locking tuners. Open-backed which looks cool. Mother of pearl (???) 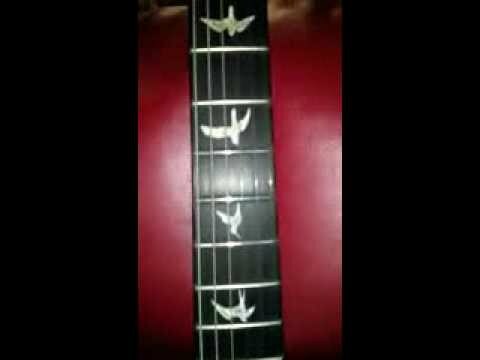 bird inlays. Quite striking. Comes with 3 springs in the back. Neck: Neck humbucker - great for creamy lead. Neck-mid: Neck humbucker split, in parallel with bridge humbucker split. Quacky single-coil sound, though "full" at the same time. I use it	all the time for clean acoustic parts in particular. Mid: Two humbuckers in parallel. More LPish in nature, I use this if I think distorted rhythm parts are too trebly / edgy on the	bridge humbucker. Mid-Bridge: Neck split in parallel with bridge humbucker. Similar to the other split position but a bit more treble and pushes through	the mix a bit more. Bridge: Bridge humbucker. Just amazing for solos. Has some of the snarl/grit you get from an LP when you hit the string. Just	sounds alive. 5-way blade is my preference. Easy to see what position you're in (compared to a knob selector). Also, I go from split neck to bridge humbucker a lot and this would require TWO actions with a toggle + push-pull configuration. 57/08 pickups (and also 59/09 and 85/15) use the original Gibson PAF winding machine, apparently. Sounds fantastic. Not too powerful, not too weedy in the case of the 57/08s. Just right. I don't like high output humbuckers. Volume control cleans up distortion very well. I don't touch the tone control much but it does work well for rolling treble off gradually. 59/09s are overwound (higher output) 57/08s. 85/15s I find have less of that syrupy magical quack of the 57/08 but they split excellently and are in between 57/08 and 59/09 in terms of output. 57/08 and 85/15 pick-ups generally can't be bought new. Note the pups don't have covers - I massively prefer this as I swear covers muffle the sound (dull the treble). 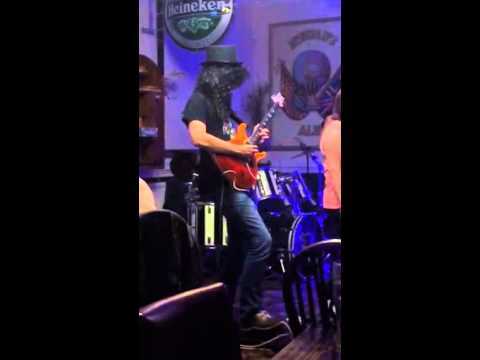 The guitar sustains incredibly well. The guitar rarely goes out of tune. If it does, it's the G-string, maybe after lots of trem usage. But it's very rare. The most stable guitar I've come across, short of those I've had with a Floyd. The guitar is a nice weight yet solidly built. Well balanced (it doesn't tip in either direction). Great QC - everything oozes perfection. The fret ends and smoothed, I swear the edges of the fingerboard are slightly scalloped - it's just a joy to glide along. The satin neck is sublime, the whole package looks fantastic and I always get questions about it at gigs. The contoured body feels great. The lampshade knobs are very good looking and have "grip" so your finger isn't going to slide off them (good for control). I have zero worries going to gigs with this. I think maple tops can ding fairly easily, though. PRS 6-point (screw) trem is fantastic. The saddles are held by the trem casing so they don't jig side to side, for increased stability. No dead spots. Harmonically rich (though my Suhr is more harmonically vibrant, admittedly). I like the pick-up rings (sort of like the trem casing... I like enclosures!). With the 24 fret models, the heel is small and to be honest, non-existent. I used to play neck-through guitars only for upper fret access but I have zero problems with this. Custom 22 heel I'm not keen on. I repeat that the satin maple neck is a thing of wonder. I actually don't like the "gloop" neck PRS much but the satin neck versions are out of this world. I prefer maple necks to rosewood, which is warmer in tone. Maple feels /sounds snappier, lighter, airier. See GAK video in further posts for an example. The pattern thin neck carve suits me perfectly. It's round at the back with just enough wood/girth. It's quite slim. Just fits perfectly, I can't say enough good words about it. Headstock design is excellent. I think it looks very classy and like how the tuning pegs are on bot sides. Because of the angle, you don't need string trees like on Fenders and there's less chance of headstock breakages like with Gibsons. Yet more plus points for PRS as a builder. The headstock is flame maple and the PRS signature is embossed, so it stands out - classy. The truss rod cover looks like graphite - I'm not sure. Again - classy. I adjusted the truss rod once when I got it to set it up and haven't needed to touch it since. Other PRS instruments are great but nothing can touch the core line, honestly. The new CE models with satin maple necks and 85/15s come close, but no cigar. Ebony fretboard "feels" slick and fast. My only worry is that whenever it needs a re-fret, it's a tough wood to work with (prone to splintering if not handled properly?). The lower body horn looks very classy as the main body colour makes way to the brown, as can be seen. The case it comes with is very nice. Faux leather on the sides. Main body is some sort of black plastic which feels sturdy and looks a lot more rainproof than the more "cloth/fabric" type cases. Nice furry inside. Nice large pouch inside for storing trem bar, strings etc. Can be locked but I never do this. Case candy includes stickers, spare screw for locking tuner, allen key, promotional material, hang tag (card describing the guitar which people like to have to prove authenticity if they want to sell). The case is HEAVY and large, though. Has an almost vanilla smell, like the Gibson cases. Sound is between a Fender and a Gibson. So if you want one of those extremes, go for the Fender or LP. PRS has its OWN sound and lots of artists use them now, and always have. One of the things people praise them for is their ruggedness, total gig machines. I've AB'd my PRS vs Fender strats and Gibson LPs... it will never sound as jangly as a Fender or have the body, grunt and growl of an LP. But in my opinion, it's the best of both worlds while being ultra-reliable and super ergonomic. -	Not as versatile as Suhr Modern which has 5-way blade plus push-pull plus blower switch. Saying that.. I'm all for simplicity and a 5-	way blade is enough for me. -	Expensive. Saying that... when you compare what you get versus some other builders, this really is a fake argument nowadays. -	Poor re-sale value at the moment (though great second hand deals to be had) on PRS. -	Some people feel PRS can sound sterile. -	Nickel frets wear out faster than stainless steel, but are less "zingy." 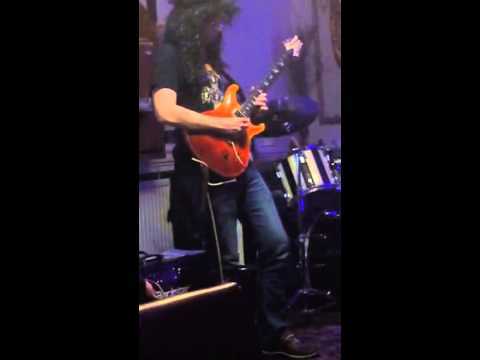 -	Some people wont like the scale length (25") on 24 fret PRS. Also, the pups are closer so the neck isn't as distinguishable as in a	22 fret model. -	The carve top can be a bit sharp if you lean on it a lot. -	Some people say the string grooves in the self-lubricating nut widen quicker than with other nuts - I hope not. -	Strap buttons appear to be larger than normal. So you'll need to widen your strap holes. -	Volume drop when splitting coils might be annoying for some. I'm actually used to it now! I've tried many, many (high-end!) guitars since getting mine but every time I taken this out of its case, my breath is taken away with all aspects of this guitar. It's annoying in some ways as I want the next best guitar but this is it! To get a core line guitar with these sort of specs now... the price has gone up. 57/08s only seem to come in private stock / artist models which cost even more. Satin necks seem to be reserved for special runs or wood library models. I'm glad I got mine when I did. I'll post a whole bunch of pics / vids now. Live, neck position through a Blackstar, Riot Reloaded distortion. Live, bridge position through a Blackstar, Riot Reloaded distortion. Three videos detailing the differences between pickup positions using clean and crunch settings. Also includes (covered) 59/09 and 85/15 comparisons. I wont re-post these in other threads but shall link to this post instead. Forgot to mention....Great support from PRS - they send out replacement/missing parts free of charge usually... and when I had a problem with one of my pickups (rare, apparently)... they sent out the switches and a spare 57/08 pup so I could get the work carried out under warranty. Awful review Thomas. I'd have expected you to put some effort in man! OK, so this gets the prize for review-of-the-year-to-date. And great to see/watch some vids too. Thanks tommy6. Hopefully get time to do review for the Suhr and maybe Blackstar etc. Many thanks for taking the time/effort on this review.I really enjoyed the trip. I read this twice looking for the price.... Doh!